When you break your leg or injure your knee, you can end up coming home with a pair of crutches. If you've never used crutches before, you need to know some key tricks to using them correctly. Unfortunately, many of us don't get the right instruction before we attempt to use them. Using crutches requires good upper body strength and flexibility. Using crutches also requires the injury to be isolated to a single leg; patients with an injured arm or two injured legs will usually require another type of support. 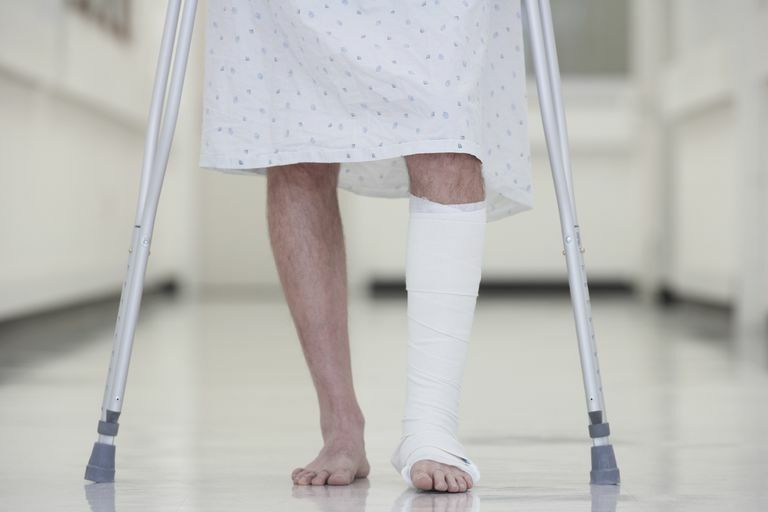 Read these tips to properly use your crutches. Check the crutches to ensure they have ample cushion on the armpit, grips, and especially on the base that contacts the floor. These parts of crutches can be replaced by a medical supply store if they become worn. You will soon feel the pain if they don't have enough padding. Place both crutches in the hand on the affected side (i.e., if you injured your right leg, grasp both crutches by the handle with your right hand). Grasp the handrest of your chair with one hand, and the crutch handles in your other hand. Place your weight on your uninjured leg and push up with your arms. Move both crutches together a short distance in front of you (about 18 inches). Always take short steps when on crutches. While supporting yourself with your hands, allow your body to swing forward as if you were going to step on the injured leg, but instead of placing weight on the injured leg, rest your weight on the crutch handles. Do not allow the crutch top to touch your armpit - keep your body supported with your hands. Stand close to the step, and place the crutches on ground level. With your weight on the crutches, pick the uninjured foot up to the step. Then bring the crutches up to the step level. Repeat this for each step. An alternative, if there is a handrail, is to hold both crutches in one hand and hold the handrail with the other. Again, lead with the uninjured leg. If you cannot bear any weight on the injured leg, you will need to hold the foot of the injured leg up in front and hop down each step on your good leg. Be sure to support yourself with the crutches held in front of you on the next lower step, or use the handrail on one side while holding the crutches in the other hand. It may be smart to have someone assist you at first, especially if you don't have good upper body strength. If your doctor says you can briefly bear weight on the injured leg, place the crutches on the next lower step and step down with the injured leg. Then quickly bring down the good leg. Take it one step at a time. Don't let your armpits rest on the crutches, even when resting. When going up and down stairs, go one step at a time, and rest at each step. How to Use Crutches, Canes, and Walkers, OrthoInfo, American Academy of Orthopaedic Surgeons, February, 2015. Which Walking Aid Is Best for You? What Exercises Help With ACL Rehabilitation? In Which Hand Should Hold Your Cane?